August 2002. Currently, it covers Delhi (2002), Kurukshetra (2004), Kolkata & Dehradun (2007), Aurangabad (2008) and Phagwara (2012). 2. Candidates are required to obtain admission to the desired school, prior to seeking Fellowship. 3. The applicant should be in class 11 th from Government school. 4. Minimum marks required for academic courses are 60% in class 10 th . 5. Total income of the family members/ guardian not to exceed Rs. 96, 000/- per year. • Application to be made on the prescribed form. Last date of the receipt of form is 31 st July. 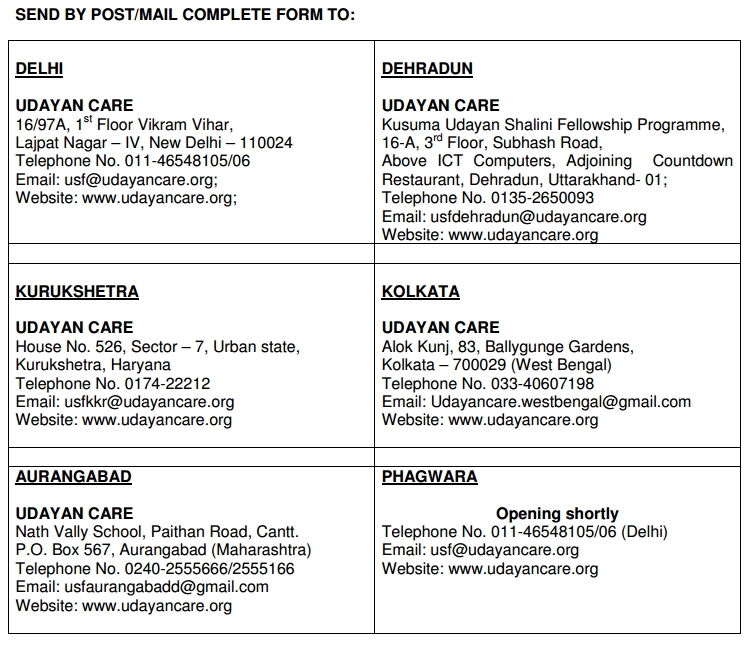 Application forms can be collected from our office or downloaded from our website (www.udayancare.org) from 1 st July onwards. • All applications shall be screened on NAT Parameters. • Short-listed candidates shall be called for a written test by the selection committee. Venue of written test for Delhi: Mahavir Senior Model School, Opp. Nanak Piao Gurudwara, G. T. Karnal Road, Delhi 110033. 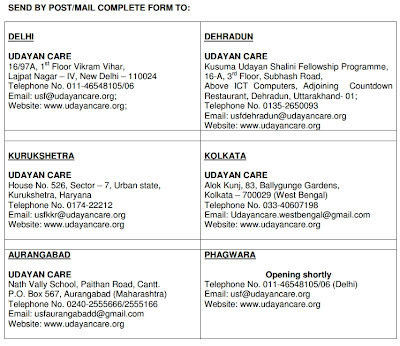 For the other state, kindly contact to respective offices. • Those who qualify the written test are interviewed along with their parents / guardian. • Those selected would be called for induction and orientation.